“Mass Leader”, Yet an another Action-thriller block buster movie of Shiva Rajkumar on Udaya TV Premier Show. Mass Leader features Shiva Rajkumar, playing an Army Officer and Pranitha Subhash in the lead roles and Vijay Raghavendra, Yogesh, Gururaj Jaggesh, Sharmiela Mandre, Vamsi Krishna, Ashika Ranganath and Parinitha Kitty play key supporting roles in the movie. Mass Leader is directed by Narasimha and produced jointly by Tarun Shivappa and Hardik Gowda.Film depicts the story of a young army officer, Captain Shivraj (Shiva Rajkumar), who fights against all sorts of anti-national, drug mafia, corrupt Chief Minister of Karnataka and takes up strong action against other illegal activities with his associates Vijay and Guru. The story takes twist when his happy family is slayed by a terror plot and he loses his beloved ones and he becomes a victim himself. He puts his life to prove his innocence and finishing off the terrorist leader behind the plot is the story tagline. Shivrajkumar was electrifying with his acting and dialogues in the movie and other supporting actors has done amazing performance throughout the movie. Veer Samarth composed all the tracks for Mass Leader, – Deepave Ninna” Mundhe Nintru songs were really mesmerizing a top on charts during its release. Director Narasimha tries to portraits the tells us that a leader is not one who gives away notes to get votes, but, a leader is one who stands at the border and fights for the entire nation. Overall, a family entertaining patriotic movie, must watch action movie for all shivanna’s fans. 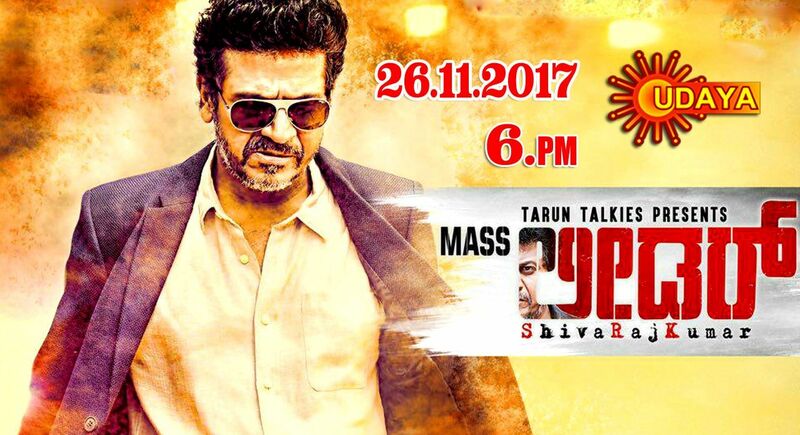 For the first time in Kannada Television, Udaya Television Premier Movie “Mass Leader’ is been telecasted on Sunday (26.11.2017) at 6 PM.